Today I thought I’d share some of the biggest fitness myths that I’ve come across. I’ve heard these from clients, friends, and even online. 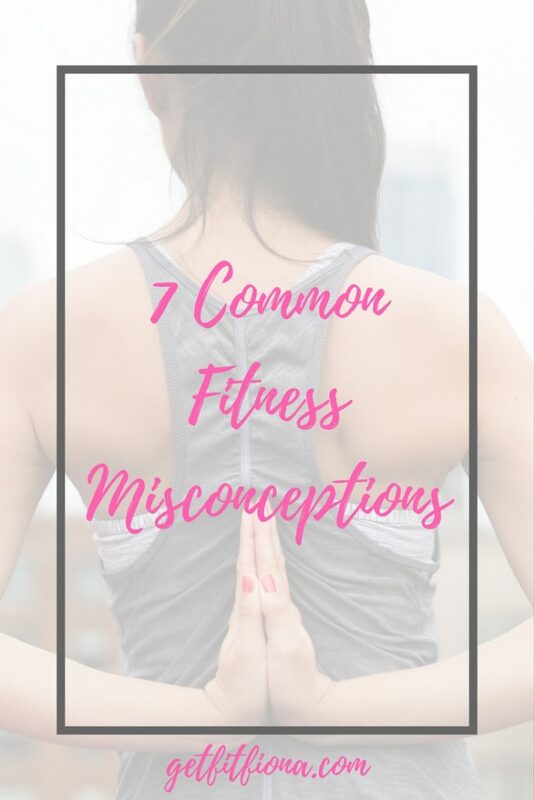 There’s a LOT of misinformation out there (especially on the internet), so I thought I’d try to set the record straight with these 7 common fitness misconceptions. The other day I was browsing through Pinterest (follow me here) and I came across pin after pin of just plain wrong fitness information. And it made me mad. No, you can’t lose 10 pounds in a week – and I can pretty much guarantee that that weight will come back quickly. No exercise can get rid of fat in a specific spot – no amount of leg lifts will get rid of inner thigh fat. Women won’t get bulky if they lift weights. I’m going to go into detail with 7 of these myths below. You can turn muscle into fat // This is completely false. Muscle and fat are two completely different kinds of tissues. You can reduce the amount of fat on your body. You can also increase the amount of muscle you have. Muscle doesn’t turn into fat, and fat doesn’t turn into fat though. You have to exercise to lose weight // While exercise can be beneficial when talking about the health related components of fitness (I explain them in this post), but your number 1 most efficient way to lose weight is to change up your diet. It’s much more efficient to not put those extra calories into your body, than to eat them and then try to exercise them away after the fact. Crunches will get you six pack abs // I’m sure we’re all heard the saying “abs are made in the kitchen, not the gym”. It’s totally spot on. Everyone has abs. Everyone. They’re simply covered by a layer a fat. How thick that layer is (and whether you can see your abs) is another story. Those with visible abs have a very thin layer, while those people who can’t see them have a thicker layer. Like I mentioned above, diet is the best way to lose weight. It honestly doesn’t matter how defined your core muscles are if they’re hidden behind a layer of fat. This is a bit off topic, but crunches aren’t the holy grail of core exercises. Planks tend to be more effective because they use more muscles, plus they don’t put as much strain on the back and neck the way that crunches do. I’m not saying you shouldn’t do crunches, just don’t think that they’re the only effective core exercise. Lifting weights will make women bulky // I see this myth all over the internet. Women are worried that if they lift weights they’ll get big and bulky, and the next thing they know, they’ll look like Arnold Schwarzenegger. First off, there’s nothing wrong with women who look like that. Second, these women did a lot of very specific things to get that way, and lifting weights three times a week isn’t how they did it. Testosterone is a big reason why men get bigger than women when they strength train. Because women have so much less testosterone than men, they have to work significantly harder than men to get the same results. Unless you’re working very hard to get that look, it’s not going to happen. You can lose more than 2 pounds per week in a healthy way // I think we’ve all seen the headlines in magazines that claim to help you lose 10 pounds in a week, or 30 pounds in a month. It’s just not true. If you are losing that amount of weight that fast, you’re losing muscle along with fat, which is counterproductive because muscle burns more calories than fat. The 2 pound (or 1 kg) per week guideline has been around for awhile for a reason. No shake, supplement, exercise plan, or anything else can get you losing large amounts of weight in a short amount of time. If it sounds too good to be true, it probably is. Making small changes in your diet is the most effective way to keep those changes happening long term. Going from drinking 6 sodas a day to none probably isn’t something that you’ll be able to sustain long term. But if you decide to cut 1 soda each week for 5 weeks, and allow yourself 1 per week after that, you’re much more likely to stick with it. Going from eating 2500 calories per day to 800 isn’t going to be sustainable either. You can spot reduce fat // I’ve had clients ask me before how to lost fat from their hips. Unfortunately weight loss doesn’t work like that. There’s no diet or exercise that can make fat leave a specific body part. If you want smaller hips, you’ll have to lose fat from all over your body. The best way to lose weight is by doing cardio // I think we’ve all overheard that one person at the gym talking about how they’ve spent an hour on the treadmill or bike because they want to lose weight. While there are lots of health benefits of doing cardio, cardio isn’t the most efficient way to lose fat. Strength training is. Like I mentioned before, muscle burns more calories than fat. Therefore, the more muscle you have on your body, the more calories it burns, even when you’re not being active. Interested in more of my fitness posts? You can find them all here. What’s one fitness myth that you’ve heard around the gym? I’ve heard most of them before, I was guilty of thinking women get bulky lifting weights! My fitness myth is running is bad for your knees! I agree with you on the running one – perfectly safe exercise or else no one would be doing it.